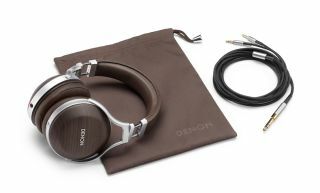 Denon expands over-ear headphone range, launches portable pair | What Hi-Fi? The existing four-star AH-D7200s (£699) sit between the AH-D5200s (£549) and AH-D9200s (£1399). The also-new AH-D1200s are £169 closed-backs. While AV and hi-fi components are very much Denon’s bread and butter, the brand hasn’t been afraid to branch out into the likes of wireless speakers and headphones over the years. Of the latter, one of the more recent examples is the AH-D7200 over-ear (£699) we awarded four stars to last summer. Any brand or person garnering fair success will naturally be egged on to become more ambitious, and here the result are the AH-D9200s (£1399), due in October (which will mark two years since the launch of the AH-D7200). They share some likenesses with their siblings: a stitched sheep-skin leather headband, and earpads made from synthetic leather and memory foam – which can only be a good thing considering we called the AH-D7200s “beautifully made” and, because of their enduring comfort, “perfect for long hours of listening”. The AH-D9200s, however, feature a newly developed version of the AH-D7200’s 50mm Nanofiber FreeEdge diaphragm, and have Japanesse bamboo housings as opposed to walnut enclosures. With Denon keen to attach different housing materials to each model (which makes for an aesthetically pleasing line-up, for starters), it’s not surprising the AH-D5200 – the most affordable pair in the range – utilise neither walnut nor bamboo. Instead, it features ‘zebrawood’ (which gets its name from its distinct striped form rather than any ligneous feature you didn’t know a zebra had). It’s supposedly very dense, good for reducing resonances. To hit that lower price point of £549, the AH-D5200 has a 50mm Paper FreeEdge diaphragm, a less advanced neodymium magnet and a faux-leather headband. They also forgo the headband stitch, as well as swapping siblings’ metal inlay logo for a printed version. Denon has also revealed a pair of £169 portable headphones, the AH-D1200s, with the ‘portable’ label referring to their comparatively practical size rather than any Bluetooth or noise-cancelling functionality. They are good ol’ straight-up wired cans. The AH-D1200s feature 50mm drivers and a neodymium magnet inside their smart, minimalist (black or white) ear cups, attached to which are memory foam and faux-leather ear pads. A foldable design and detachable cable with an Apple-compatible in-line remote also helps them fly the flag for portability. Their EQ can also be customised via Denon’s app.